The match with Dungannon may have been called off - but Glenavon trained on the pitch. 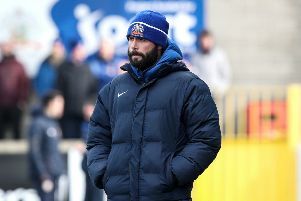 Glenavon’s clash with Dungannon Swifts was called off just an hour before kick-off on Tuesday night. Referee Tim Marshall deemed the pitch frozen and unplayable. That meant frustration for the fans from both sides who had made their way to the ground after the match had got the all-clear following an inspection at 3.45pm. Even more bizarre as Glenavon then held a full training session and match on the pitch. The match will now be played next Tuesday night.